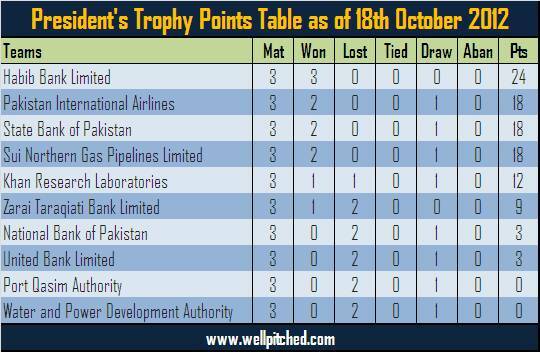 It has been 3 weeks since Pakistan's domestic season got underway with the President's Trophy First Class competition that involves 10 department teams. HBL, UBL, PIA, SBP, NBP, KRL, SNGPL, WAPDA, Port Qasim, and ZTBL have been engaged in this departmental tournament and all of Pakistan's test cricketers have been involved thus far. Habib Bank, who are being captained by Younis Khan, are sitting at the top of the table currently with 3 wins out of 3 thus far; while PIA, Sui Gas, and State Bank follow with 2 wins each in their 3 matches. Fawad Alam, who is captaining Natonal Bank of Pakistan, is the leading run scorer thus far, with 361 runs in 6 innings. He has already knocked two centuries and one fifty, and is looking in sublime form, just like he does in every domestic season. It is quite unbelievable that a player like him who averages 58 in first class cricket, which is more than most Pakistan cricketers of the past and present, and who scored a debut test century, has had only 3 test caps. Younis Khan is also looking in good touch with the only two innings that he has played producing a 48 and an unbeaten 101. He was on 101 overnight in HBL's match against SBP that started yesterday. Mohammad Hafeez has had a decent run as well with 227 runs in 5 innings at an average of 45.4, while Umar Akmal has had two knocks of 48 and 40. But the other three - Misbah, Taufeeq Umar, and Azhar Ali have had a torrid time at the crease. Pakistan test captain Misbah has managed only 53 runs in 5 innings, while Taufeeq and Azhar Ali have managed 129 and 158 in 8 innings respectively. Among the bowlers, Habib Bank's Ehsan Adil is the leading wicket taker currently with 25 wickets in 4* matches. Ehsan is only 19 years old and is in his debut first class season. He was also a part of Pakistan's U19 World Cup campaign a couple of months ago. Aizaz Cheema has also been in fine form with the ball picking up 21 wickets in 4* games, while two slow left arm spinners - veterans Kashif Bhatti of UBL and Zulfiqar Babar of WAPDA have picked up 23 wickets apiece. With no international tours over the next 2 months for Pakistan, all the test players are involved in this President's Cup, which will make the upcoming weeks even more exciting. My bets are on Habib Bank to continue their winning ways and remain at the top of the table. If you are looking to be in sports, click here for the best betting sites. Stay tuned for more updates as another week of the President's Cup unfolds.